Hot, sweet, savory and delicious! 1. Mix together cream cheese and creamed roasted garlic. 3. Place 1 pitted date in each half red Jalapeno pepper on top of the cream cheese mixture. 4. Roll up stuffed Jalapeno pepper in bacon strip. 5. 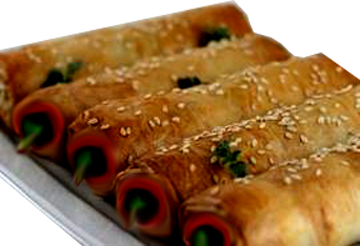 Lay rolled up stuffed jalapeno on a well buttered strip of phyllo dough. folding in the end of the phyllo and buttering the outside as you roll like a cigar away from you. they are golden brown. Cool and enjoy. A perfect appetizer for 2 or 3 persons.